It’s Saturday again and that means another round of Saturday Sweeps. Come back each Saturday, and I’ll share my favorite sweepstakes for the week. I’d love to hear about a DSM reader winning big! This week’s Saturday Sweeps is brought to you by Kellogg’s Snackpicks. NASCAR fans, this one is for you. Ever doubt the athleticism required to not only be a driver, but to also be a member of the pit crew during a professional auto race? 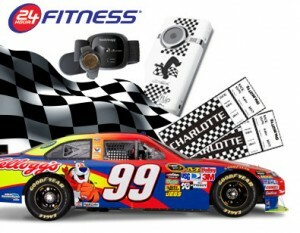 Kellogg’s Fuel Your Days sweepstakes is giving you the chance to win a trip to Charlotte to get the full racing experience. You’ll get a tour of the Roush Fenway Complex, have a workout with the pit crew trainer to see just how athletic racing is, and then you’ll head to lunch with the pit crew. The winner will also receive a 24-hour Fitness bodybugg personal calorie management system for 12 months and FLIP video camera with Carl Edward’s signature. The 6-day/5-night trip includes $1000 of spending cash and ends with two Grandstand tickets to the race on 10/16 in Charlotte, NC. This is the ultimate racing experience! Plus, 100 people will win a first prize, 24-hour Fitness bodybugg personal calorie management system for 12 months, and 25 people will also win a “Carl’s Signature” FLIP video camera. Enter through September 9th. No purchase necessary. Limit one (1) entry per person. OfficeMax is giving away (5) grand prizes of a trip for four to a Jonas Brothers concert in San Francisco on 9/18 in their Jonas Brothers Winning the Dream Sweepstakes. Enter daily through 9/4. Enter to win a Caress Girls’ Getaway and you could win a trip to New York, Las Vegas or Miami for you and two girlfriends. Enter by 10/4. Enter to win a 64 GB iPod Touch (3rd Generation) from Classic Heartland, and be sure to check out all their other current sweepstakes after you enter! MGM Grand is giving away a weekend stay in their hotel in their Get a Life Giveaway. Enter to win by submitting a video about your lame life. Need to get in shape or want to keep up the routine even after the weather gets cold? Enter Good Housekeeping’s Get in Shape Sweepstakes and you could win a NuStep T5XR Recumbent Cross Trainer valued at $6,000. Ends 8/31. See the previous Saturday Sweeps for more chances to win! Previous Post: « Burger King: Free Kids Meal for Their Birthday!